Here you can compare and look for cheap chews for dogs online most especially if you have a limited budget. Your dogs will surely love these treats. Our supportive team of bargain hunters has listed the latest cheap chews deals and special offers available for you. Save as much as 50% on selected products when you purchase at Amazon, ASDA, and Superdrug. You can pick the most ideal product that is suitable for your needs. Take advantage of chews special offers from clearance sales and enhance your shopping experience from the best options. Give your pet the best and most affordable chews out there! At one point in the lives of dogs, there will be a need to give them chews. This is when a chew toy comes in. Usually, it is used for animal stimulation. It is also useful to occupy their attention so they will not get bored. Gnawing on a chew soothes and assists animals, especially puppies, to ease the pain of having new adult teeth. It can help them develop. In the market, you will come across different kinds of chews for dogs. Among them are wood, rawhide, mineral, and paper. Chews are not only exclusive on dogs. They are also for rabbits, rodents, and birds. Just like humans, animals experience stress and anxiety as well, and giving them chew toys enables the deal with these negative feelings. When you give your pet chews, he will be distracted from destroying other important and forbidden items in your home. Doing so does not only help them achieve healthy teeth but also fosters discipline. There is also another toy synonymous to chew. It is called a teether. 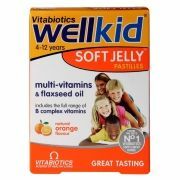 This is intended for children who are experiencing inflamed gums while they teeth. Needless to say, this can be an effective tool as well. Do Dogs Like Bones or Rawhide Bones? Observe dogs and you will notice that they will always have the urgent to chew. Chewing is the best to exercise their jaw muscles. It can also help scraping away dental plaques if there are. It wil be a relief from irritate gums whenever your pet is teething. Furthermore, it can relieve the boredom of your dog. A natural habit. For all canids, chewing has always been a natural instinct. If there is a natural raw bone, it will encourage your pet to chew. You can take advantage of that to provide nutrients. You can start with a calcium boost. Mental stimulation. Dogs will always require mental exercise. This is in equal to how much physical exercise they need. When you give your dog something to chew, it will keep its mind and body occupied. Give your dog this as a treat. Oral health. Chewing has been excellent to keep the oral health of your dog in shape. It will be the exercise of its jaw muscles that will in turn scrape plaques and tartar. When this happens, your dog will be refrained from the discomfort of teething. There are plenty of ways to save on your purchases online. Most online UK shops such as Amazon, Approved Food, Pets at Home, PetPlanet, and ASDA have regular sales, seasonal clearance, and flash sales where you can get up to 50% off on a wide array of cheap dog treats, and dog treats. You can also search for dog treats Tesco here easily. There are even retailers that have 3 for 2 and 2 for 1 offers on select items. Also, the best time to get huge savings is during Black Friday, Cyber Monday, and Boxing Day where an extensive selection of products like dog chews for teeth, and natural dog chews UK from your favourite UK retailers are reduced to clear. Knowing when and where to look for the lowest possible price on beef dog chews, healthy dog treats, puppy chews, and natural rawhide dog chews UK is the key here. Fortunately, you don't have to spend hours online searching for special offers, bargain deals, and price drops on dog treats pedigree, and natural rawhide dog chews. Our massive community of bargain hunters regularly share verified discounts, promos, and voucher codes from Monster Pet Supplies, eBay, Argos, Wilko, and from other reputable shops across the country. We also have a team of money-saving experts who always share essential tips and tricks on how you can get every day low prices on cheap chews when shopping both online and instore. Getting additional money off with the help of Latest Deals is easy. You can maximise your savings by simply using the latest chews discount code, and chews deals of your choice upon check out. There are also voucher codes that can provide you with free shipping and gifts. Your dog is not exempted from pain of a cavity or broken tooth. Oral hygiene is important. It will be a vital part of your care. At one point, you have to think about getting a dental dog chew. There are products designed to remove tartar and plaque. The cleaning happens with an effective chew. There are many veterinarians that suggest owners to have chews. They can help reduce the need for a dental care all the time. Even if you have this though, you still have to think about cleaning its teeth more often. Please do so. 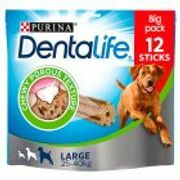 Greenies Original Dental Dog Treats. The Greenies Original Dental Dog Treats are the leading dental chew on the market. This brand is preferred by many dog owners in the market. Made from the United States, this is sourced to other countries now. It is low in fat that is crucial for outweigh pups. Moreover, this also features added minerals and vitamins for a greater nutritional value. Blue Buffalo Dental Chew for Dogs. 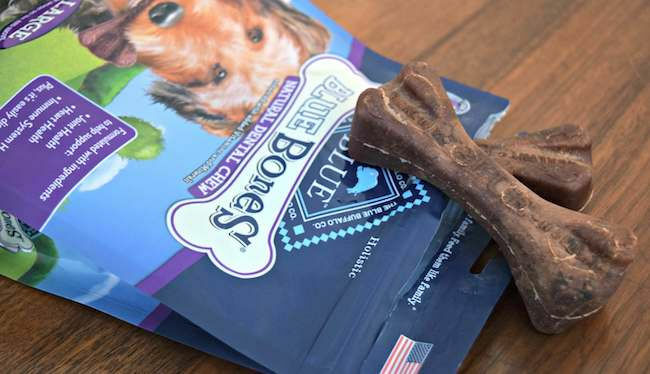 The Blue Buffalo Dental Chew has so many benefits to your dog. It will not only keep your puppy's teeth clean; but, it will also ensure that your dog’s hygiene is maintained. This is made of all-natural blend of ingredients. Moreover, this does not have wheat, corn, soybeans and other poultry byproducts. Milk-Bone Brushing Chew. 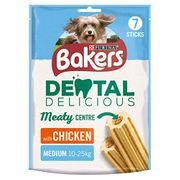 The Milk-Bone Brushing Chew is a chicken-flavoured oral health treat. It has reduced plaque, and tartar buildup. Moreover, it can freshen the breath of the dog. This rice-based formula does not have any soy products. This product is made up of 16 essential vitamins, and minerals. Pedigree Detastix Large Dog Treats. The Pedigree Detasix Large Dog Treats are for larger breeds of dogs.As a matter of fact, this is not allowable for dogs under 30 pounds. As compared to other dental treats out there, the treats are not hard to chew because of their texture. The product is in X shape that would enable your pup to possibly grip. It is made of chicken flavour and meaty smell dogs. Lastly, this is a wheat- and rice-based recipe without soy. Virbac C.E.T VeggieDent Dental Chews. This Virbac C.E.T VeddieDent is based on rice, corn, and soy-based recipe. This can keep the teeth of your dog clean. Furthermore, this will also develop the natural chewing behaviours of your pet. This is made up in the Z shape that is easy to manage and handle. At the end, this can reduce plaque and assist remove tartar from the teeth.